Lots of folks ask about what I am up to. 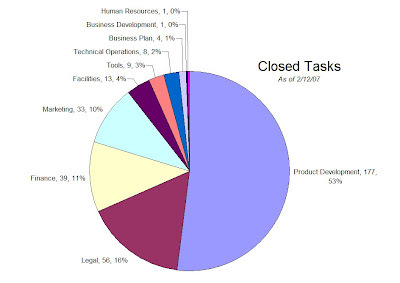 "How do you divide your time between the various business functions at this early stage?" "How much time do you spend actually coding?" "You're really just playing World of Warcraft all day aren't you?" Initially, items other than product development sucked up a fair portion of my time - particularly legal items related to incorporation and trademarking (using Cooley). Later, I had to allot some significant time to finance tasks related to setting up my accounting (using Montgomery Professional Services Corp) and getting QuickBooks Online up and running. Now, fortunately, I am almost 100% on product development tasks which is really where I want to be spending all of my cycles right now. 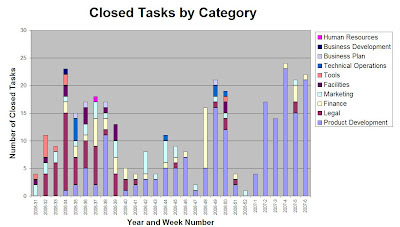 Not surprisingly, my productivity (as measured by closed tasks which is not a true measure of productivity, but probably a reasonable proxy in my case) tanked during the holidays. The troughs line up with Thanksgiving (week 47, 2006), Christmas and New Years (weeks 51, 52 of 2006 and week 1 of 2007). 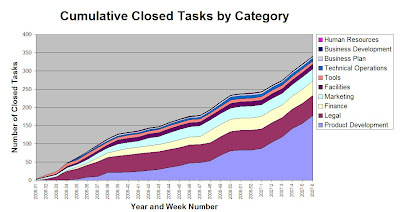 The low weeks prior to that (weeks 40-43 of 2006) were dominated by iterations on the logo design and think-time/research around the product which tends to be hard to quantify. It will be interesting to see how the allocation mix changes over time. I expect several more weeks of very heads down product development. Then, we should see some considerable percentage of time on Technical Operations as I transition from pure development mode and open up FamZoo to more outside Beta users. Having a production Web hosting solution in place will be a prerequisite for this step. As I get closer to launch, more and more of my time will be dominated by Marketing and Business Development activities.